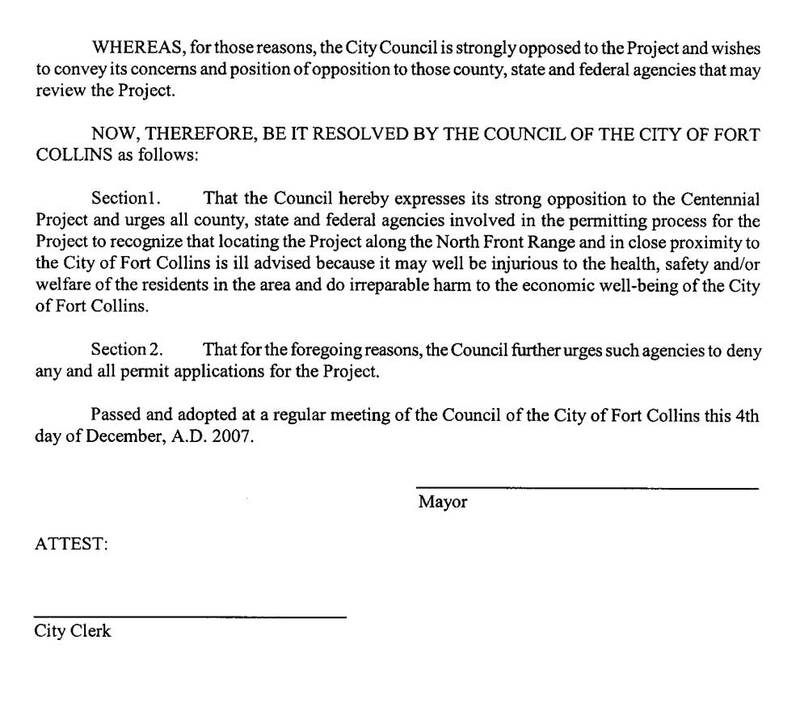 Following on the heels of a New York Times story contrasting Fort Collins' "green" image with the specter of open pit uranium mining eleven miles from its thriving downtown business area and six miles from the outdoor Fort Collins Soccer Club Complex, the Fort Collins City Council will consider a resolution opposing the project at its December 4 meeting. City staff has been studying the proposed Centennial/Indian Springs project for several weeks in response to requests by council members to look at the issue. Staff members have drafted a thoughtful and strongly-worded resolution of opposition to the project. The resolution points out the proposed mining zone is in an area near Fort Collins which is experiencing rapid population growth. It says the site is unsuitable for uranium mining because health risks to nearby residents cannot be determined with any degree of certainty. 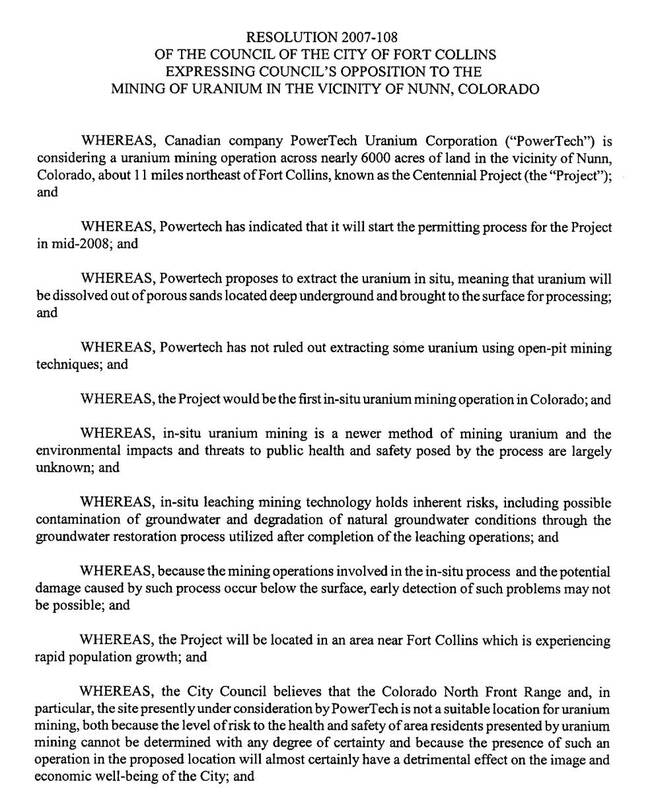 And the resolution recognizes the fact that a large uranium mining operation so close to Fort Collins will have a "detrimental effect on the image and economic well-being of the City". The resolution finishes by urging all federal, state, and county agencies involved with the permitting process to deny any and all permit applications submitted by Powertech. The resolution focuses on in-situ leach (ISL) mining. What Fort Collins city staff and council members may not be fully aware of is the potential for radioactive windblown dust to be dispersed over the city from multiple open pit uranium mines. The majority of the project's identified uranium ore is in the southern half of the proposed mining area which is the area closest to Fort Collins. These ore deposits sit above the water table and cannot be mined by typical ISL methods. In spring 2007, Powertech went on record stating these deposits would be extracted by open pit mining. Since then the company has back-pedaled on this issue, floating the questionable idea that the area can be flooded to create a man-made aquifer that is amenable to a "modified" ISL method. Company officials admit this idea has never been attempted. Powertech refuses to rule out open pit mining on the four non-contiguous sections that make up this southern area. Dust containing uranium and radium-226 would be lofted from these open mines, blown for tens of miles in all directions, and dispersed over cities, towns, parks, open space, farms, and ranches. On average, the area northeast of Fort Collins experiences wind speeds of 50 miles per hour at least twice a month, with peak wind speeds exceeding 75 miles per hour. Approximately 5-10% of the time the wind blows, it comes from the northeast which would carry contaminants from the mines directly over the city of Fort Collins. An affirmative vote by council members on Tuesday night will add their voices to the thousands of northern Colorado citizens who have already spoken out against this ill-conceived plan. They will be joining many others, including U.S. Congresswoman Marilyn Musgrave, the Colorado Medical Society, the Larimer County Medical Society, state representatives Randy Fischer and John Kefalas, who have gone on record in opposition to the project. In addition, U.S. Senator Ken Salazar and State Senator Steve Johnson have expressed strong concerns about whether current regulations adequately address risks to underground drinking water. One of Powertech's proposed open pit uranium mine sites is 6 miles northeast of Fort Collins' city limits, 6 miles due east of the Fort Collins Soccer Club Complex, 4 miles northeast of Cobb Lake, 5 miles due east of the Colorado State University Agricultural Research, Development and Education Center, 6 miles northeast of the Anheuser Busch Brewery, 2 miles north of Black Hollow Reservoir, 8 miles northeast of the Fort Collins Country Club and Long Pond, and 9 miles northeast of Lindenmeier Lake.